The opening at the top of a bottle or jar. The maximum volume of a bottle when filled to the top. The type of style and size of the part of the bottle or jar that holds the cap or closure. The first number applies to the neck diameter in millimeters and the second is the thread count. The spiral of plastic on which a C/T closure is twisted. The collar of plastic directly beneath the neck area where the closure rests against. The volume measured in cc's, ml's, or ounces of a bottle published in standard sizes by the industry. 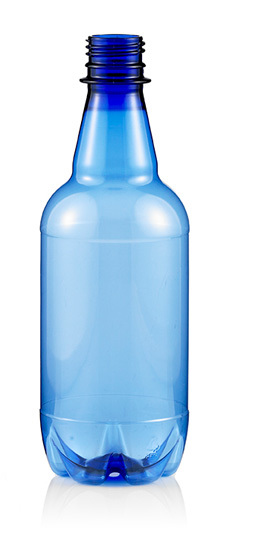 The sloped area of a bottle or jar between the neck and the body. The area of the bottle's body where a label can be applied. The thickness of a bottle, most often measured along the side walls. The bottom of a bottle or jar. The indentations on the base of a bottle or jar that aligns the bottle for printing and filling. A method of fabrication in which a warm plastic parison (hollow tube) is placed between the two halves of a mold (cavity) and, by using air pressure, the parison is forced to assume the shape of the cavity. The air pressure is introduced through the inside of the parison. The air pressure forces the plastic against the surface of the mold that defines the shape of the container. A chromatic (brown) color of glass or plastic containers. It is used principally to protect the contents of the container from exposure to light. An uninterrupted protruding helix on the neck of a container used to hold a screw-type closure. A devise used to seal off the opening of the bottle to prevent the loss of its contents. The plastic forming the opening of a container and shaped to accommodate a specific closure. A type of thread configuration designed so the thread segments are disposed equidistantly around a bottle neck (finish). The closure has matching portions that engage each of the thread segments. Also, a small indentation or raised portion on the surface of a container. The lug provides a means of indexing the container for operations such as multi-color decoration or labeling.